Included here are all pictures of repair, depot and accomodation ships. These pictures are published for pleasure/information/research purposes only and are not for sale or copy under any circumstances. Information in captions has been researched as thoroughly as possible but it accuracy cannot be guaranteed. 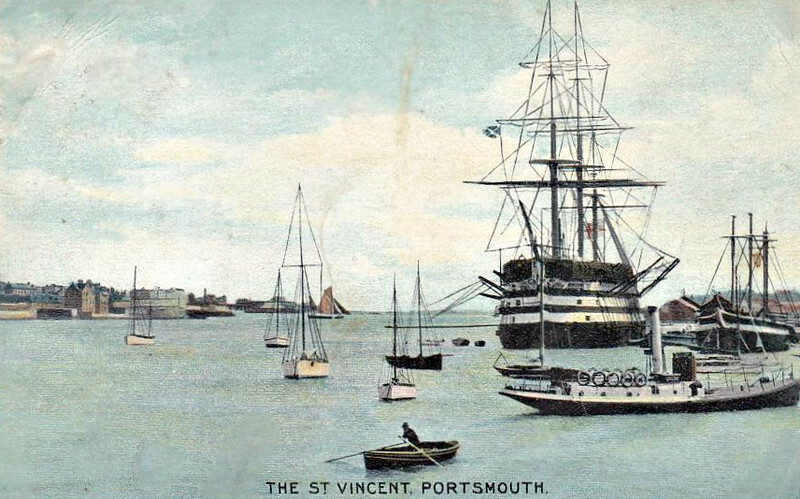 1815 to 1906 - ST VINCENT - Nelson Class Ship-of-the-Line - 4672 tons - 62.0 x 16.4 - 1815 HM Dockyard, Devonport - 120 guns - 1815 to lay-up from new, 1829 Channel Fleet, 1831 Mediterranean Fleet, 1841 Harbour Service, Portsmouth, 1847 Channel Fleet, 1854 Troop Transport, 1862 Training Ship, 1870 Boys Training Ship, Portsmouth, 1906 broken up - posted December 23rd, 1905.